We want to sincerely thank you for volunteering to test our new PLA/PHA filament. In your samples we added suggested temperatures for each material that you’ll receive. Also, you could check our website for some recommendations from one of our contributors Julia Truchsess, who has other suggested parameters (https://meltink3d.com/blog/). PLA/PHA has a lot of features: more impact tolerant, odorless among some, but it is a little tricky to print with. The parameter can vary depending on each printer machine. This is the reason why we need people to test this product to eventually establish the range for each type of machine. Please let us know if you have any questions and we’ll be happy to assist you. I received my MeltInk filament samples, and I am printing some test prints today. I’ll be posting my results this afternoon. Thanks again for the opportunity. I have been unsuccessful at getting my Dremel or Ultimaker 2 Extended+ to feed the filament to print anything yet. Not sure what I’m doing wrong. The Ultimaker doesn’t feed the filament at all, but I’m guessing it has something to do with it being 1.75mm. But my understanding was that the new Ultimaker would take either without any adjustments. The Dremel loades and extrudes the filament, but it’s just caking up on the nozzle. I’ve leveled the bed numerous times to no avail. Could not successfully get the filament to work on the Dremel because I can’t adjust temperature. Could not get it to work on my Ultimaker 2 Extended+ I think because it’s setup for 3mm filament. So, I had to move to my Makerbot Replicator 2. Filament loaded like normal, leveled the bed several times as I had issues with it sticking to build plate at 220, 230, and 240. I added stick glue to the plate which seems to have solved the sticking issue. Only my Ultimaker has a heated bed. My results thus far are photographed below. Tried printing this low poly ring to no avail. Regardless of what temp, layer height, or plate adhesion was used, it simply did not stay put on the plate. I honestly have to admit, that I’m a no nonsense guy. I would not purchase filament that I have to spend so much time with to find the right “tweaked” settings. Leaving the settings and level as they are, it prints flawlessly using the Makerbot filament. This may be why I always buy the filament that is specifically for the printer brand I own. Set it and forget it. Unfortunately, I lose out on some possibly great filament out there. I’ll try the ABS later today or tomorrow. I received the new 2.85mm filament yesterday. I’m now successfully printing on the Ultimaker. I still haven’t tried the ABS on the Makerbot yet. Just returned from Spring Break. I’ll take photos and post my results after it finishes printing. Thanks Meltink! Your filament is working beautifully with a very slight adjustment of temp. This worked great! The filament printed just as good if not better than my standard Ultimaker filament. I printed at 225°C and the bed at 65°C. I can only imagine how much better it would have turned out if I used higher resolution settings. Now I’m printing the PLA 2.85mm Silver. So far the Silver PLA 2.85mm is printing wonderfully. I was a bit skeptical with the lower temp and bed temp, but it so far is error free printing. I noticed the PLA/PHA has a bit more flexibility than the PLA which I like. I must admit that I have not been able to successfully print any model without a raft or brim using Ultimaker filament, but with the MeltInk all my models are printing without that wasted base. You have made a believer out of me. Great product on the Ultimaker. I don’t know if the 1.75 filament is any different from the 2.85, but I still have been unable to successfully print on the Dremel or Makerbot so I must be doing something wrong. Thank you very much for agreeing to spent your time helping us test our filaments. We excitedly wait your results. I’ve received mine and will post information soon on the prints I’ve started over the weekend. Unfortunately since I don’t remember which is which you may need to re-look up what filament was sent to me and let me know if the gold is pla or the pla/pha for my information to be of any valid. Lost the paper I wrote it down on. You chose: PLA/PHA: Gold The other is PLA for your glow in the dark one! I received mine today also and will start printing something tonight. I also had the same issue as Tanya, I don’t remember which is which - think you can help me Karen I really appreciate Meltink for these samples, I was already thinking of trying it. Sorry I did not identify the samples. 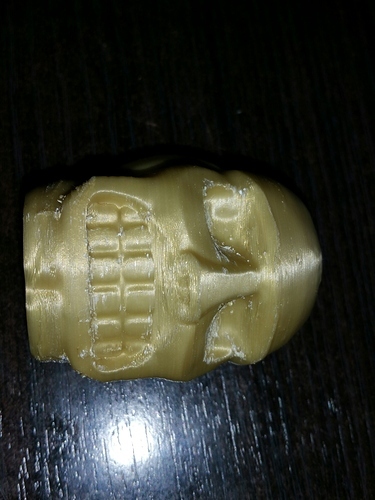 You chose PLA Cool Grey and PLA/PHA Gold. Thank you for having Meltink in mind and also for helping us to test our filament. Thought it would go good with the Gold PLA/PHA you sent me. At first I started printing at 225c but it seem my extruder had an issue with it and I even stopped the print and started over (it was a mess). It wasn’t laying down as it should and part of the print would just follow the nozzle. So then I started the print you see using 230c and increased the flow rate 10% . After about 20mm I thought it wasn’t laying flat as it should and I raised it to 235c. It seemed to print really well once that temp settled. You can even see it on the pictures I posted, the first 20mm wasn’t that sharp. This model needed support for the nose and the hole on the eyes. I found the support attached too well to the model, an issue I usually don’t have with other filament, using the same slicer. But this is the first time I increased the flow rate and usually those supports should be thinner, so I will need to take that into account next time. So in summary. It takes a little tweaking to get it to print out right, but once you do it’s really nice. I love the color and the fact it isn’t so shiny like regular PLA. Which is what I like the most about PLA/PHA, looks like ABS without the warping issues. On the Robo 3D it seems it likes the temp at 235c which is 5c above recommendation. I will say it was easier to mess with this one than other brands I have tried, so I’m definitely gonna get my hands on more. Supports: Bunny yes, Marvin no. Overall I like the filament. 200C gave best results with a speed of 50 mm/s. Minor warping that occurred could have been dealt with if I had my 2nd fan addition on, but since Printrbot Simple Metals only ship with one I only had the main one on. Recommend filament for support free designs as supports left ugly markings on the bunny. Mistakenly thought this was the PLA/PHA and printed the bunny at 225C. Still turned out great despite some stringing between the ears. Supports came off cleaner than the Gold bunny. Printed the Marvin at 210 and print turned out clean. No warping occurred on any of the glow in the dark prints though the cat did run off with the other Marvins so those are MIA in the picture. Overall this may be the best glow in the dark filament I’ve tried and may order a spool in the near future. Best temp was 210. 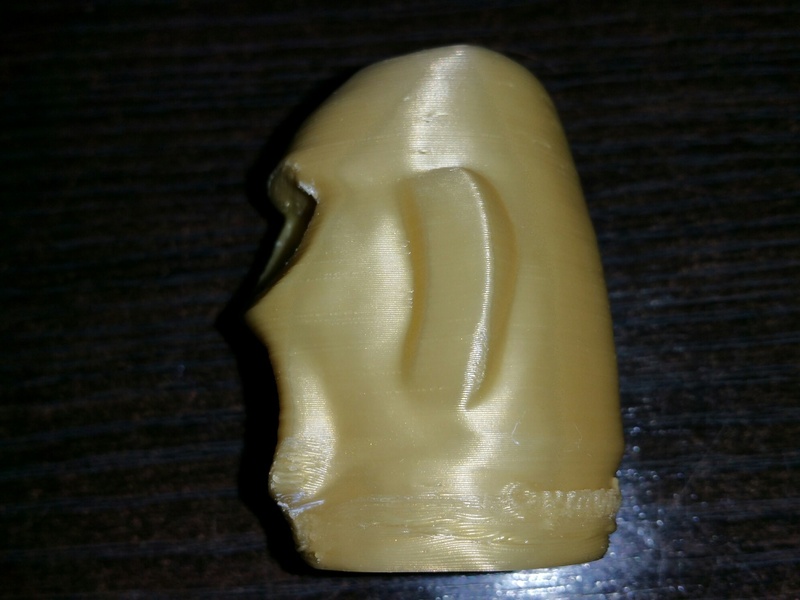 We are glad to hear that you liked our Gold PLA/PHA, even though you had to make some adjustments to get a satisfactory impression. We really appreciated that you share the parameters for your specific machine. We’ll be more than happy to have you as our customer. Thank a lot for your help and time. I want to thank you for all the time you have spent testing our filaments and establishing parameters for each materials. We apologized for unmarked filaments, but it’ll help us to improve our next time service. . We might conclude PLA/PHA is more recommendable for unsupported printers. PHA adds hardness to PLA, making support removal much more difficult. We are proud that you liked our PLA Glow in the Dark. Thanks again for your help. PHA adds hardness to PLA, making support removal much more difficult. I have found that the Slic3r program generally goes overboard with support material and have on a number of occasions imported STLs into Blender and added my own supports where required. Doing this would also allow the maker to increase the gap between the print and the support which may help with removal. As with Slic3r, you can only select 0mm gap for dissolvable supports or 0.2mm gap. This may be an area I can test out when I receive my test filament. By the way, I may need to be reminded of which color is which type myself. 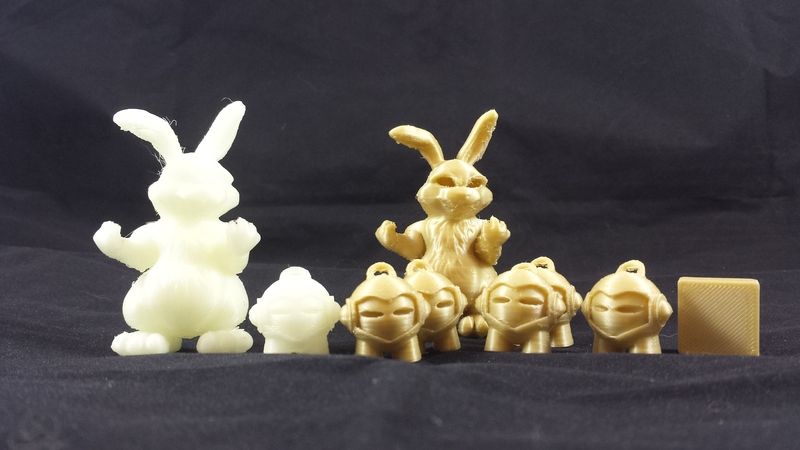 I had custom supports with the bunny design. Gap between design and supports was 0.3 mm. Support webbing infill was 15%. Maybe a bigger gap or less support infill is needed for supports to leave less of a marking? We really appreciate you taking the time to test our filament and comment about it. I am sorry to hear about that. It is very wear. 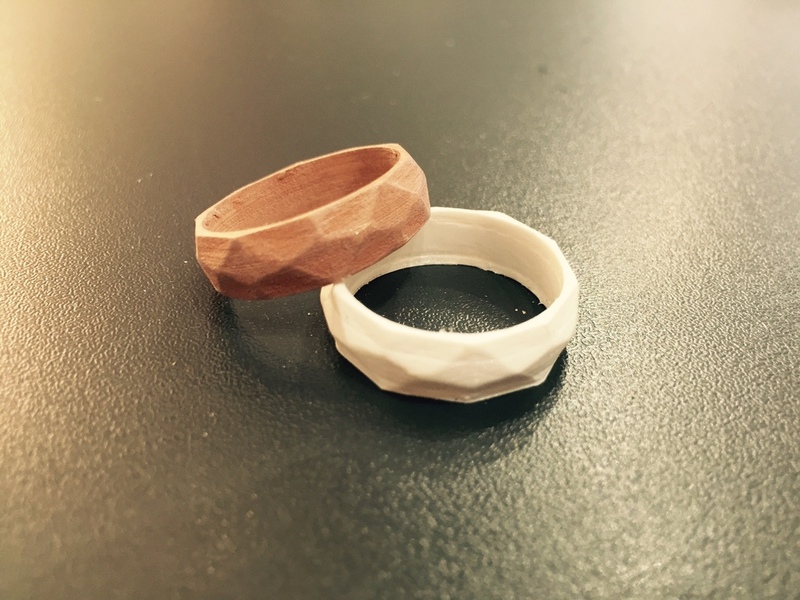 Sometimes you have to obtain the best settings for a new material based on the specific printer, by experimentation. We have customers who have had good results on Makerbot Replicator, but I know it might required to much time. Again, I apologize for your printing problems and I am very grateful for your feedback. We would like to make up for all your lost time. I could send you other complementary sample of other filament that you would like to try. Also If you could be interested to try our new 2.85 mm filament for your Ultimaker we’ll send you one immediately . Until now we only have it in Black PLA and Black PLA/PHA. We’ll be waiting to hear about your next ABS results or to help you in whatever you could need. Sure, I’ll keep testing whatever you’d like for me to test. I’m trying the ABS today. I think the Dremel’s limited ability for customization is what prevents me from testing the filament as it does not allow for changes in the temp. I’d like to test the Ultimaker with your larger filament. I still have some filament PLA/PHA filament left for about 2 more models that I’ll continue testing with the Makerbot. I have expectation that the ABS will be easier from my experience using ABS vs PLA. I’ll post my finding today. Are you using the default slicer software that ships with your printers? If you are not allow to change temps in your current software I would highly recommend trying a different slicer. 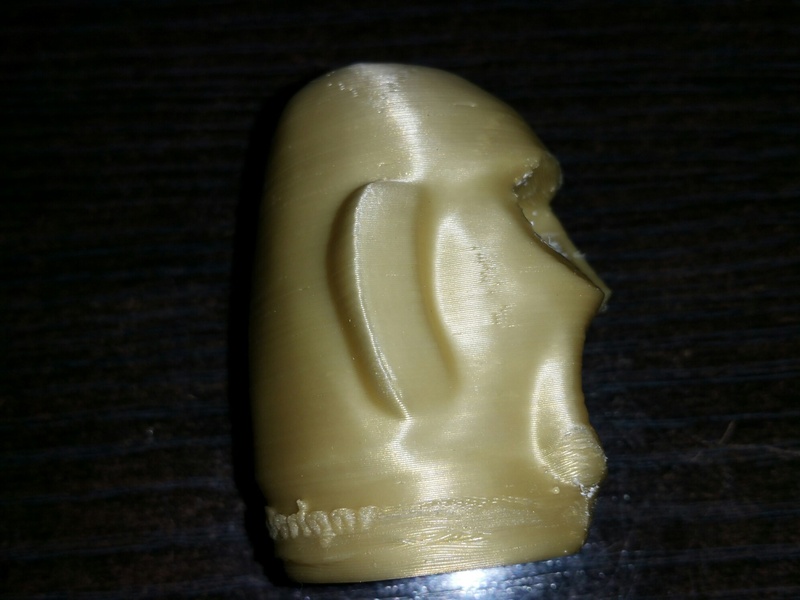 Simplify3d works with Dremels. I’m using Print Studio from Autodesk. Simplify3D does allow you to change the temp on the Dremel, but after reading about some that did that it’s not something I’d recommend as the electronics in the Dremel are not designed for higher temps. The Ultimaker is a size issue as it’s setup (filament feeder, extruder tubing, etc.) is for 2.85mm. Smaller filament pools at the extruder and clogs. The Makerbot which is the only one that seems to use the filament extrudes, but doesn’t stick to build plate regardless of leveling or temp. 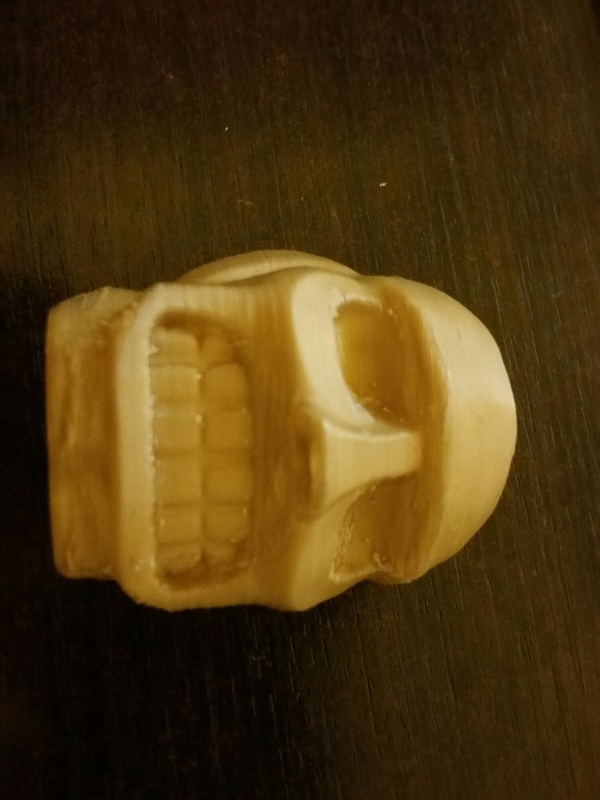 I’ve used the Makerbot Slic3r as well as Print Studio. Hey @neilblue, just to remind you of your colors!